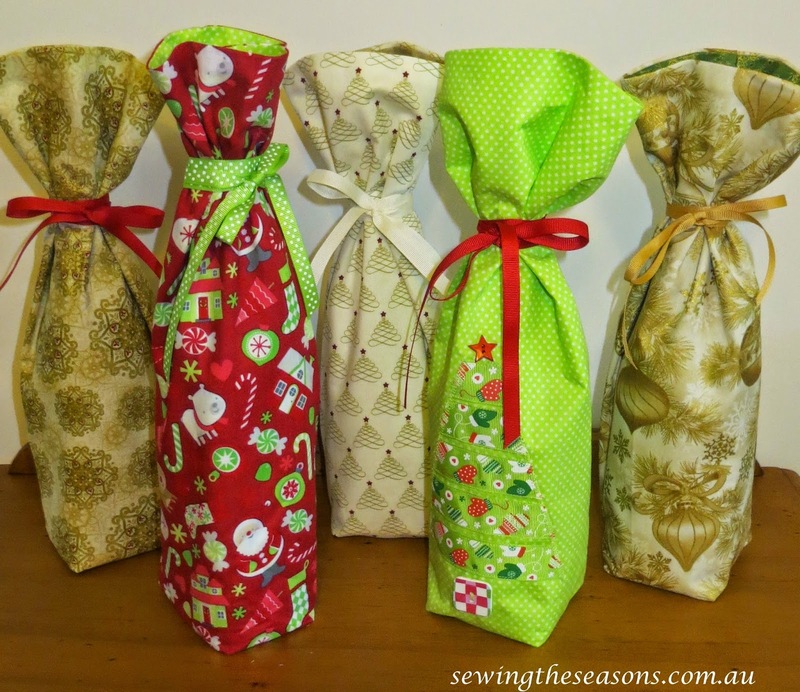 Quick & easy, this tutorial shows you how to whip up a lined bottle gift bag in next to no time. After searching for the measurements for a bottle gift bag, I found I had to either purchase a pattern or print off a PDF download ensuring my printer was set to "tile" the pattern piece, so an hour or so with some fabric, a bottle & tape measure & I came up with this quick & easy tutorial. This method also means very few seams & no fiddly measurements for casings for the tie. It is a generous size to allow for different sized bottles. 2 -3 yds ribbon for the 3 ties - for each bag 20" (50cm) of 3/8" (6mm) ribbon to wrap a few times around. 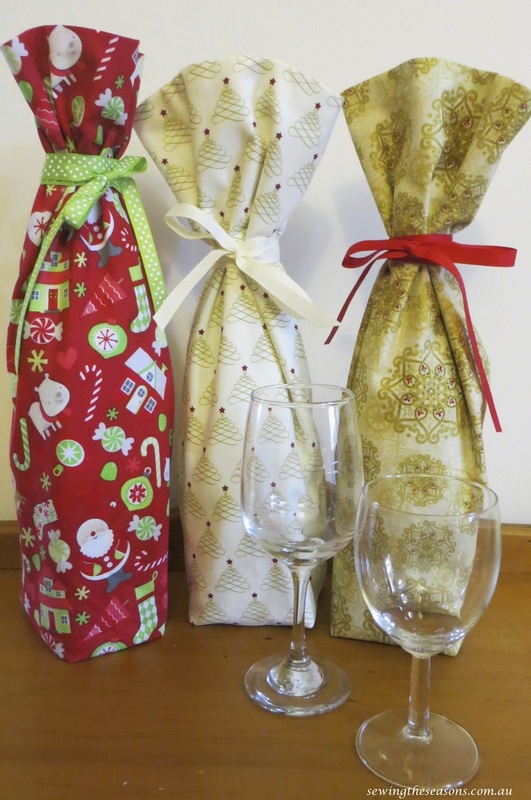 ** I use 35" (90cm) as I like the effect of wrapping a couple of times round the bottle neck before tying the bow. All seams 1/2" unless indicated. If you want to pad the bag or line bag for added stiffness or to soften effect of lining colour cut out wadding/interfacing piece 17" x 13 1/2" and if iron-on, press to back of main fabric piece now. This is also the time to add any embellishments to main fabric piece. I would recommend interfacing or wadding if you are adding a feature such as the ribbon Christmas Tree (see photo at end of post) for easier attachment & a better finish. Pin ribbon tie which has been folded in half (if ribbon has pattern, patterned sides together) 4" (10cm) from top of bag on main fabric side. I also pin the ends of the ribbon to avoid them getting caught in seams = pin is removed when bag turned through. To strengthen tie, sew a couple of times over the ribbon fold before joining side seams. Stitch up main fabric & lining fabric piece, leaving a gap of about 3 - 4" for turn through using 1/2" seam. Press seam open. Fold bag in half, with seam in middle of bag. Stitch across the bottom of each end. Mark & cut out 1 1/4" square on each corner at each end. Note - measure up from the seam not raw edge of fabric across base. Pinch corners together, ensuring the seam is in the centre, finger press bottom seam open & stitch across each of the 4 corners with a 1/4" seam. Turn bag through, before stitching gap closed, make sure all the corners have been pushed all the way out then hand stitch or machine close to edge to close the turn through gap. Push lining down into the bag. Here is a back view of the bag, showing how the ribbon is attached ready for tying. Add bottle, tie bag & it's ready to give! You can also decorate your bottle bag before construction. Next tutorial will show how to sew the ribbon tree either for a bag or decoration. And of course, you could make the bags out of other fabric to use throughout the year when gift giving.